Jacques Revou and Isabel de Rosier are at the height of their careers. Of course those careers are as professional charlatans, thieves without peer. With the completion of their final heist, they decide it’s time to retire and settle down. But they have not escaped unnoticed. 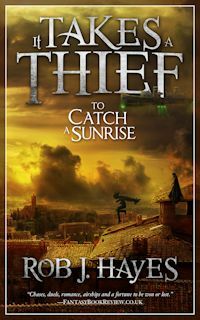 The king’s spymaster, Renard Daron, has a job for the thieves, one only they can perform, and he does not take no for an answer. With the threat of destitution and death hanging over their heads, Jacques and Isabel must take on their greatest roles yet, the Baron and Baroness Bonvillain. Can they ferret out the treasonous elements within the government? Can they escape the clutches of the nefarious Seigneur Daron? Can they regain the fortune so unfairly taken from them? And, can they finally complete their one last job?